We can supply 6ft/12ft (1.83m/3.66m) trampolines which will always come fitted with full safety nets. One image is below shown without safety net for clarity only. 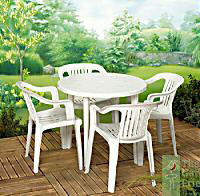 we can supply circular tables and arm chairs in white for any occasion. All tables and chairs are renewed every season. Minmum order 15 chairs.